Prepared meals delivered to your home means that you can eat fresh, creative, delicious meals without putting in the effort yourself. It's like outsourcing, but for cooking. This is a huge list – and it'll probably grow more in the future. In the interest of saving time, I'll pick my Top 3 right here. Keep in mind, these types of meals usually do come at a cost. Your monthly food budget will balloon if you start eating these meals every day. But you don't have to make this an every day thing to benefit from a meal delivery service. Even just three days a week could get you from Monday-Wednesday without stepping into the kitchen, and then you'll have Thursday out, and Friday-Sunday cooking your favorite home cooked meal. Even for those that are not ‘busy' in a traditional sense, having a fresh meal delivered to your doorstep can mean a lot. Those with disabilities, or the elderly in our community could benefit immensely from a subscription to these services, so even if it's not for you, this might be a cool suggestion or gift for someone close to you. There are a bunch of specialty meal services listed here, like meal services for seniors, or even meal delivery for bodybuilders! There's no shortage of options below. I've currently got 50 going, but feel free to add your own suggestions in the comments. As I try out as many of these as I can, I'll add link to full reviews so you can see what my opinions are. For now, I'm still check out meal kit services, which require to to prep and clean, so are not much of a time saver (except for the grocery shopping aspect). Those are more fun for me so I can learn some different cooking techniques. Plus, I enjoy cooking and work from home, so have the time to prep and photograph those kits for the blog. Have you tried any of these on the list? Let us know your opinion in the comments! California Chef Services is a local area meal services that only delivers to the Greater Los Angeles and Thousand Oaks areas. Unlike many other services, the meals are all prepared by local chefs when they are ordered (rather than beforehand). This promotes much more customization and the company allows customers to make many requests about their meals. As a result, California Chef Services is a powerful choice if you want senior meals or diabetic-friendly meals. Simply put, they're able to cater for more dietary needs and restrictions than most other companies. They offer meals in four different categories: Diet, Healthy Family, Vegetarian, and Senior. But, these are just designed as guides. You talk to the company to determine your precise plan. This includes factors such as what ingredients you prefer, the styles of meal you enjoy and any dietary restrictions. California Chef Services is an expensive service but it offers more customization than most other companies. The catch is pricing. Meals from California Chef Services are considerably more expensive than most other companies. Ordering one dinner per day starts at $25 for non-organic and $28 for organic. The price per meal is lower if you order multiple meals in a day. The company can still be worth it if you need to heavily customize your order. If that's not the case, other companies may be a better choice. Fresh n’ Lean uses plant-based ingredients to prepare gluten-free and organic meals. They offer four weekly menus to choose from. One is simply a Plant-Based Meal Plan and there is a Low Carb/Low Calorie Plant-Based Meal Plan too. They also have a Performance Paleo Meal Plan and a Protein Plus Meal Plan. The available meals change weekly in all cases and there are plenty of interesting breakfasts, lunches and dinners provided. Regardless of the menu, members can choose breakfast, lunch and/or dinner for either five or seven days each week. The price per meal varies depending on the plan and the selections. But, the averages range from $9.33 per meal to $12.69 per meal, with the performance plans costing more than the plant-based ones. Fresh n' Lean offers four different meal plans and various ways to customize your order. All of the meals provided are gluten-free, soy-free, and dairy-free. You can mention any allergies and food preferences during the ordering process. Items can also be added onto your subscription, including breakfast, snacks, entrees, sides, and bulk meals. Finally, you can order A la Carte. There is a $105 minimum order when purchasing this way and meals are priced individually. Since its establishment, Healthy Chef Creations has been a popular national meal provider of prepared gourmet meals. They have six meal plans: Healthy Mommy, The Healthy Chef Diet, Healthy Living – Breakfast & Dinner, Healthy Living – Lunch & Dinner, Healthy Living – Breakfast, Lunch & Dinner, and Healthy Living – Dinner. Each meal plan comes with various options. These include changing the size of the meal or the calorie range, depending on the specific plan. You can also choose how many days per week the plan covers. However, you have no choice about the specific meals that are provided. You can also order A la Carte, where meals are priced individually. 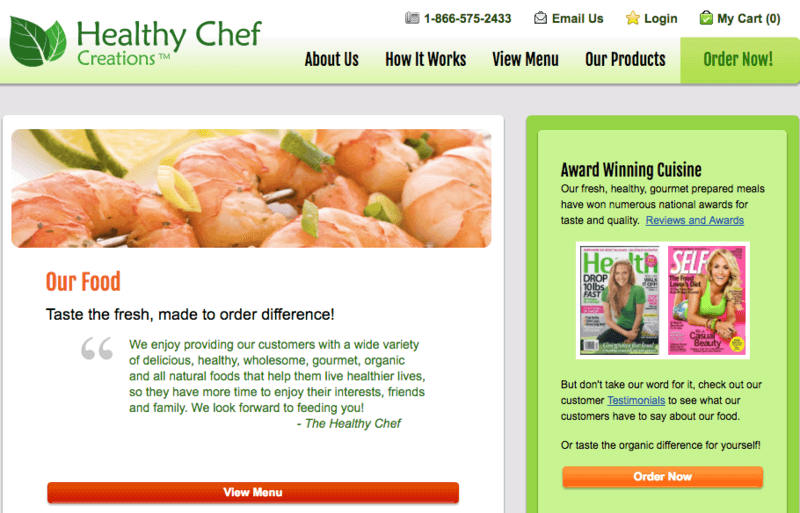 Healthy Chef Creations offers various menus to choose from and is a popular meal service. The meal plans cost from $17.99 per day if they contain one meal, $34.99 per day if they contain two and $49.99 per day if they contain three. A la Carte meals vary dramatically in price. But, many dinners are $16.99 for a regular size and $18.99 for a large. The A la Carte meals typically allow you to choose your side dishes and you can sometimes make specific requests as well. Caveman Chefs is a paleo meal delivery service. They have three plans, the large plan, the medium plan and the XL plan. As the names suggest, the meals vary in size. The larger ones are perfect as meals for athletes or just for people with large appetites. Members can purchase either six or ten meals per week for ten weeks. The prices are $13.75 per meal for the medium plan, $16.25 for the large and $18.75 for the XL (not including taxes and fees). Payments are made monthly. Caveman Chefs offers paleo meals and has many different sizes to choose from. They also have meal plans by the pound and there are three options here as well. With this style, you can choose between three or five meals per week. The plans cost from $365 to $1,120 per month, depending on the plan you choose. The paleo focus also means the meals tend to be protein-heavy and are powerful for both nutrition and physical performance. Beetnik Foods is a little bit different. The company currently offers 18 different frozen dinners, along with two sauces and some grass-fed beef meatballs. All of the meals are certified as organic by the USDA and they are also gluten-free. There are no vegetarian options. Instead, the meals either use chicken or grass-fed beef. Many of them are also paleo. The style is a great way to stock up your freezer. The meals are much healthier than what you'd find at a grocery store and taste amazing as well. Beetnik offers a limited selection of frozen meals but these are organic and very healthy. Meals are sold individually for $7.99 each. You can also buy value packs for $59.99. Each of these contains eight meals of the same type. Variety packs are provided as well. One costs $62.99 and the other is $84.98. The value and variety packs work out a little cheaper than buying the meals individually. But, the price difference isn't large. Established in 2012, Paleo On The Go is another paleo delivered meals service. It focuses on providing meals that align to the paleo diet and to the types of meals that our ancestors once ate. Some of their meals also fall into the Autoimmune Protocol (AIP) approach and Paleo on the Go has an individual menu to make these easy to find. They also have a Strict 30 menu (similar to Whole30), a discount menu, and a seasonal menu. The AIP menu has meals that provide gluten-free and natural foods that support the healing of the body and also help people with food insensitivities and autoimmune conditions cope with such diseases. Paleo on the Go is a good choice for paleo and AIP-compliant meals. They have a decent selection, although the meals aren't cheap. Meals can be ordered individually and the price varies depending on the item. Examples include Bangers and Mash for $17.50 and Butternut Squash Lasagna with Beef for $19.00. The meals typically contain a single serving. There are also meal bundles, which offer discounts. The current one costs $235.00 and contains 10 complete meals and two soups. That averages out to around $19.50 for each meal or soup, which is higher than many other companies. The Magic Kitchen meal delivery service focuses on supporting a wide audience. Their meals cover many types of diet, including renal, senior, diabetic-friendly, dialysis-friendly, dairy-free, portion-controlled, low-fat, low-sodium, and vegetarian. That's not even all of them. They have two main menus, A la Carte and Complete Meals. The complete meals typically contain an entree and either one or two sides. The A la Carte meals include sides, soups, breads, main courses, and side dishes. All meals are tagged based on the diets they support, making it easy to find the best ones for your needs. Magic Kitchen caters for a wide variety of diet types, including some unusual ones. They pay special attention to seniors and those with health problems. Ordering a meal is easy and they do have gift programs. On average, a single meal costs between $10-$25 depending on your order specifications. For example, a dinner for a senior with BBQ chicken drums, corn, broccoli, and black beans has a price of $11.50 per serving. For a family sized bundle, two meals range between $166-215 with six servings. You can also call the company and develop a personalized meal plan. Schwan’s is a frozen meal company, one that provides a wide range of different products. Their extensive selection is probably their biggest advantage and means that most people will find some meals that suit their needs. One example of this is their Asian menu, which includes Asian appetizers, sauces, and sides, all with consistent quality and taste. There are also desserts, handheld pizza & crusts, and fried okra. Their menus also include Wendy’s menu, McDonald’s menu, KFC menu, Subway menu, Applebee’s, plus many more. Schwan's is a frozen meals company with an extensive selection and many different styles of meal. They focus on preparing foods that eliminate fats as well as hydrogenated oils. Their foods meet the USDA guidelines, and they provide proteins, fiber, calcium, and whole grains. Their meals are gluten-free and organic. A meal like Chili with Beans costs $4.50, chicken and turkey entrees have a value of $5.50, and seafood entrees cost $5.50. The price for appetizers like Asian-style Chicken for Lettuce wraps is $12.99, while Shredded Steak Taquito costs $12.89. 22 Days Nutrition meal delivery service prepares and delivers 100% organic, gluten-free, and vegan meals to your doorstep. All of the meals are fresh, never frozen. 22 Days sells organic and vegan meals. These can be ordered through a meal plan or via the A la Carte menu. The main way to order is their Weekly Meal Plan. This is available in 5-day, 7-day, or 22-day versions. The 22-day option is the best value for money and can be as low as $9.50 per meal. The meals tend to be exciting and unique as well. They are a great way to get more plants into your diet and to experiment with plant-based foods. However, the site offers few details about the meals that are provided and members don't get to choose what they will eat. The alternative is A la Carte, which allows you to choose your meals. The breakfasts cost $6.95 per meal, while lunch/dinner dishes cost $12.95. There is a minimum order size of $75. The flexibility of this version is appealing. But, there aren't many dishes to choose from at any one time. As the name suggests, Paleo Power Meals delivers foods suitable for athletes and people on the paleo diet. To do this, they closely follow paleo principles and ensure that their meals are all high in protein. There are no specific meal plans. Instead, you order meals individually. Their options include breakfast, lunch, and dinner, along with various sides. There are also bulk menu items, which allow you to order 1 lb of various items, like grass-fed ground beef or buffalo chicken strips. Paleo Power Meals allows you to order meals individually and offers discounts off the total order price. The meals are all individually priced. Breakfasts are between $5.95 and $10.95, lunches are between $9.95 and $13.95, while dinners are between $10.95 and $14.95. Paleo Power Meals does provide discounts based on your order size. An order of $75 (or more) gets a 5% discount. The discount increases to 10% if you spend $150 and 15% if you spend $200. Ice Age Meals is a convenient choice for paleo frozen dinners. The meals are all healthy and they also tend to be meat heavy. There are around 17 meals currently, with no vegetarian options. The meals are all dairy-free and gluten-free. Ice Age Meals advertises itself as being paleo, although a few of the dishes are tagged as paleo + rice (so, they're not technically paleo). Even so, the dishes are all hearty and would be very satisfying. If you follow paleo strictly, you could just stick to the meals that don't include rice. Ice Age Meals provides paleo frozen meals that can be ordered packs of 14, 24 or 48. They attach a list of the macronutrient breakdown on each package and balance most of their meals to the Zone diet with 30% fat, 40% carbs, and 30% proteins. They adjust the textures and flavors to ensure that the meals all freeze and reheat well. The main way to order is by building a box. This allows you to select your own meals. A 14-meal box costs $174.99 (around $12.50/meal), a 28-meal box costs $279.99 (around $11.60/meal), and a 48-meal box costs $534.99 (around $11.15/meal). You can also order themed samplers, such as Hold the Hog (no pork), Beef Me Up, Scotty (all beef), and The All American. But, the prices are exactly the same as building a box yourself. Trifecta offers an assortment of healthy, nutritious, and convenient meals. Their meal services incorporate a variety of meal plans including Paleo, Vegetarian, Classic, Clean, and Vegan. To ensure a balanced diet, they include local veggies, seeds, meat, fish, leafy greens, nuts, and seeds in their meals. They collaborate with local farmers for organic and eco-friendly foods, and they pack orders in recyclable packages. Trifecta caters for many different diet types while providing high-quality and healthy meals. The Classic Meal Plan starts at $119 per week, while the Vegetarian and Vegan Plans are both from $113.90 per week. The Paleo and Clean plans are both less expensive, starting at $108.43 each week. You can choose the frequency of meals on each plan, which may change the price. They deliver all meals with precise information regarding the calorie and macronutrients. Their nutrition is straightforward, and their prices are competitive. They do not charge a shipping fee for any order. Food can also be purchased A la Carte. But, this doesn't provide whole meals. Instead, you're buying individual components, like 1 lb of venison for $25.35 per week. Kitava is a physical restaurant, located on Mission Street in San Francisco. They use services like Caviar, GrubHub, and Uber Eats to deliver their meals fresh to customers. The style means that you can order meals and receive them the same day. The food is also unusual and tastes amazing. For example, their lunch and dinner menu includes Meatloaf & Sweet Potato Mash, Zoodles & Meatballs, Street Tacos, Baja Bowl, Cuban Bowl, California Salad, and much more.They have a list outlining the nutritional information and ingredients used as well as photos of each dish. Some meals allow you to choose the type of protein out of two or three options. Kitava offers restaurant-quality food delivered to you locally. Their menu is small but the food looks amazing. They use non-inflammatory ingredients and the finest quality oils like sustainably sourced palm, avocado, and olive oil to prepare the meals. They also rely on almond flour, arrowroot, cassava, and coconut to ensure all meals are gluten-free. They only use natural sweeteners like the Grade B maple syrup, coconut palm sugar, and raw honey. The price of their meals ranges between $12 and $14, while the desserts cost $6. Paleo Diet Delivered offers powerful meals for weight loss and extra energy. The dishes are effective for athletes as well, acting as a decent source of protein. The meals are provided in biodegradable and recyclable packaging. There are few customization options but you can choose the best meals for your particular health needs. Paleo Diet Delivers is a high-quality company and is another good paleo choice. The meals are all priced per item with the prices are listed on their website. For example, you can buy poultry at $16.95 or juice at $12.95. Paleo Diet Delivered focuses on a macronutrient distribution of 40% carbohydrates, 30% protein and 30% fats, which is perfect for health and weight loss. Freshly has been in operation since 2015 and delivers fresh meals to your door. Their food is never frozen and it is always gluten-free, refined sugar-free, natural, and high in protein. All meals just take three minutes to heat, making them a fast and easy choice. You choose your meals from a weekly rotating menu. This typically contains 24 (or more) entrees, along with a handful of breakfasts. There is significant variation between the meals. Freshly also uses tags like under 500 cals, paleo, high protein, soy free, and vegetarian. These make it easy to select the meals you want. Freshly allows you to choose your meals from a weekly menu. You can order 4, 6, 9, or 12 meals each week. Meals aren't ordered individually. Instead, there are four plans, ranging from 4 to 12 meals per week. The 4-meal plan costs $49.99 per week ($12.50/meal), the 6-meal plan costs $59.99 per week ($9.99/meal), the 9-meal plan costs $89.99 per week ($9.99/meal), and the 12-meal plan costs $107 per week ($8.99/meal). Send A Meal delivery service brings tasty foods in a variety of gourmet styles from vendors. As such, they're not creating the meals themselves. But, the service can work well and they have some interesting options. Meals can be ordered individually, in samplers or through a meal of the month club (for 3, 6, or 12 months). The price of the 3-month meal plan is $199.95, the 6-month meal plan is $389, and the 12-month meal plan is $699.95. Some meals serve multiple people, while others are single servings only. For example, their Chicken Fried Steak Dinner serves four and costs $39.00. The meals include crab meat and scallops, marinated Italian chicken breasts, roasted potato wedges, pot roasts, pork tenderloin, and more. The desserts include examples like lemon tarts, cheesecake, and carrot cake. You can choose exactly what you get if you order individual meals. However, the bundles typically choose your meals for you. Send a Meal offers some unusual ways to order and includes many meals with multiple servings. Many of the meals and bundles are tailored to specific health needs. There is no minimum order, deliveries are on the exact date, and you can demand a refund if the shipment is late. They have a wide variety of gourmet meal products and their deliveries are efficient across the nation. 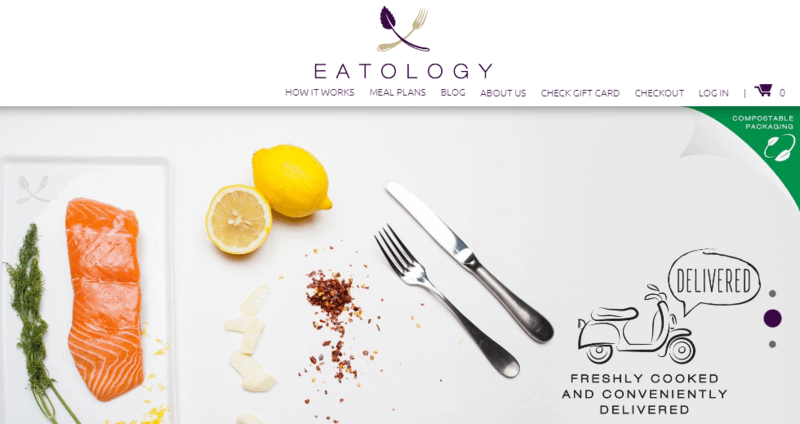 Eatology specializes in creating healthy meals that taste like they're ‘cheat meals'. To do this, the company heavily relies on fresh fruits and vegetables, healthy fats, and natural sources of protein. They do not add any sugar to their meals, but instead, they use small amounts of sweeteners like honey. All of their meals can be reheated in the microwave or the oven, making them very easy to prepare. Eatology offers two different meal sizes, along with a family platter. The menu changes daily and you can simply choose whichever meals you're interested in. Meals come with full ingredients lists, but most don't have any photos on the site. The prices do not vary based on the meal. Instead, the price is determined by the type. All 2B meals cost $10.50 per serving, 3B meals cost $12.75 per serving, while a family platter will cost you $35.00. You can order in blocks of 10, 15, or 21 meals each week. This can be a single order or a recurring one. Located in San Diego, Pete’s Paleo is a meal service that delivers fresh organic paleo meals. The company heavily relies on fresh ingredients. In fact, the menu regularly changes to reflect what is currently being harvested from local farms. This creates more variety than most other companies and leads to some very interesting meals. However, you're always limited by whatever is on the menu for a given week. The meals do look amazing but they may not be suitable for picky eaters or people with multiple dietary restrictions. Pete’s Paleo has five weekly meal plans. The first three of these offer 5, 10, and 14 meals per week. Members can choose to add on extra sides or protein to their order. The 5 meals version starts at $123/week, the 10 meals version starts at $189/week, and the 14 meals version starts at $249/week. There is also a family plan for $324/week, which includes 5 meals with 4 servings each. Finally, there is a vegetarian plan for $129/week that offers 10 meals. Pete's Paleo offers fresh and highly seasonal meals, along with five different meal plans to choose from. There are also some other items on sale, including their signature bacon and bone broth. Products are delivered nationwide and San Diego residents can pick up their order, if they choose to. Factor 75 is a good choice for healthy delivered meals. All of the food is free from soy, gluten, preservatives, hormones, and antibiotics. The animal protein used is sustainable, with any beef being pastured-raised and grass-fed. The ingredients are also organic. Many of the meals from Factor 75 are suitable for keto, paleo and/or dairy-free diets. The company uses simple tags to highlight which meals suit each diet type. The meals themselves aren't amazingly creative and the selection isn't as large as it could be. But, Factor 75 provides better images and descriptions than most other companies. The nutritional details are more in-depth as well. These aspects can help you choose the best meals to promote your health. Factor 75 works well for anyone on a keto, paleo or dairy-free diet. The company also provides considerable details about each meal. They have five meal plan options depending on the number of meals you want. The least amount of meals you can get is four at a price of $16 per meal. You can order up to 18 meals at $11 each. There is no delivery fee except for people who live very far from Factor 75’s headquarters. If you have an active lifestyle, continually backpacking across regions, you know how difficult it is to find low-calorie healthy food. Eating healthily becomes more challenging if you are on a specialty diet or have dietary restrictions. Paleo Meals To Go is the only meal delivery service that caters to people looking for paleo meals in this situation. Paleo Meals to Go offers freeze-dried meals that are perfect for camping and emergencies. This is because they don't deliver fresh or frozen meals. Instead, Paleo Meals to Go provides freeze dried meals. Their selection is fairly small but the meals get consistently good reviews. Many people say that they taste better and are more filling than regular freeze-dried camping meals. They do not have meal plans. Each product is priced and sold as an individual order so you can shop for whatever combinations you want. They offer meals such as Mountain Beef Stew, Summit Chicken, and Fruit Snacks at prices ranging from $3 for food bars and $11.50 for meals. As such, Paleo Meals To Go is something you can commit to for regular backpacking trips. The company has recently combined with Wild Zora. This may mean that their pricing and selection changes over time. But, even if it does, Paleo Meals to Go is still an unusual and powerful choice for health. Like many other food delivery services, Grandcestors was created with the intention of providing a healthy alternative to fast foods. Grandcestors just offers seven different meals, which are all pre-prepared. This means that you can't make specifications about what you get. But, the meals are all paleo. So, they're free from grains, legumes, milk, soy, artificial ingredients, and added sweeteners. Examples of their meals include Not Yer Momma's Meatloaf, Grumbo, and Chicken Tikka Masala. The site provides nutritional details for each meal. Grandcestors aims for roughly 40% carbs, 30% protein and 30% fat in their meals, although this will vary somewhat depending on the dish. Grandcestors offers a small selection of frozen paleo meals that are easy to order and to heat. The meals can be ordered individually from the site. They cost $9.99 each (plus shipping), regardless of what you choose. There is a 10% discount if you order more than 25 meals at a time. But, that's the only discount available. One Paleo Delivers offers paleo and Whole30 meals to the Southern California region. Whole30 is a variation on the paleo diet, which tends to be stricter. It is promoted as a way to reset the body and to help people develop a good relationship with food. One Paleo Delivers only offers two meal plans but these can be customized in various different ways. There are two main meal plans provided. One offers three meals and two snacks daily. It starts at $60 per day. The other contains two meals and one snack, starting at $45 per day. In both cases, you can choose the duration, from 5 days all the way up to 60 days. Each meal plan provides various options. You can make it Whole30 for an extra $5 per day. You can also add extra meals and/or snacks. The portion size can be changed as well – up to extra large, which offers 2,400 to 2,600 calories per day. There are some substitution options for the meals you receive but you don't have complete control over what you will be eating. Sunfare promotes both weight loss and healthy eating (of course, there are other weight loss meal companies too). To do this, they offer five meal plans, each with a different focus. Their most famous example is The Signature Diet. The plan can be customized to meet individual macronutrient goals and desired calorie intakes. Sunfare even promises that they can support most diet types and provides more than 100 alternate meals for their daily selections. The other plans are Vegetarian Life, Paleo Fit, Family Dinners, and The Cleanse. These tend to offer fewer customization options, although you can still specify dislikes. Regardless of the plan, you are able to choose which meals you get. Sunfare has a comprehensive calendar allowing you to make as many (or as few) substitutions as you would like. Sunfare has five different plans and may be a powerful choice for weight loss. Each meal plan offers weekly and monthly purchasing options. The monthly option can be for 20 or 28 days and gives three meals each day (plus two snacks). For the Signature Diet, the 20 day version costs $1,279, while the 28-day costs $1,790. Both calculate out to $63.95 per day. Other plans have different prices but a similar pattern. The weekly plan allows you to choose how many meals you get each day and which days you get them for. It allows more flexibility than most other companies, including the chance to get different meals on different days. But, the price per meal tends to be higher. They say they exist to deliver more than healthy food to their clients; they also provide happiness. Admittedly, this is a cheesy claim, but Veestro is a popular service and tends to get food feedback. The company focuses on plant-based meals, including some that are unusual or creative. They offer four main plans: A la Carte, Meal Packs, Weight Loss, and Juice Cleanse. Veestro is a powerful plant-based company that provides appealing food and has many plans. The Meal Packs start at $8 per meal and can be ordered on subscription or as a one-time delivery. The Weight Loss plan can be for 3, 5, or 7 days per week and delivers two weeks' worth of food at once. This one starts at $8 per meal as well and is subscription only. The A la Carte menu allows you to order meals individually. The dinners range from $10.49 to $11.99, which is fairly reasonable. You can also order breakfasts, soup, desserts, and juice via the A la Carte menu. The minimum order size is $35 and you do need to pay for shipping. Mamasezz is another plant-based food company. They avoid using oil, dairy, gluten, refined sugar, or preservatives in their meals. By doing so, they produce high-quality meals, ones that are often tasty and appealing. The style is unusual, as Mamasezz doesn't have a meal plan per se. Instead, meals can be purchased individually or in bundles. Most individual dinners are $15.99. This pricing is very reasonable, as the dinners typically serve three people. Many are also kid-friendly, making this a good company for families. MamaSezz is a plant-based company that has many good options for families. The bundles simply contain multiple meals at a discount. For example, the Family Bundle costs $99 and contains a total of 18 servings. MamaSezz estimates that this is enough to feed a family of two adults and two kids for between four and five days. Other bundles are similar. You don't get to choose the meals in the bundle. Instead, they are pre-determined based on the overall theme. Plant-based meal companies have many similarities, including an emphasis on high-quality ingredients and creative meals. But, Foodflo manages to be a little different as well. Not only are the meals plant-based and organic, they're also vegan and alkaline. Reviews suggest that Foodflo manages to make some amazing-tasting meals, even for people who are wary of vegan meals. The company offers a new menu each week and all meals are chosen from this. FoodFlo offers alkaline vegan meals that are consistently high in quality and flavor. Foodflo offers one-week deliveries, four-week deliveries, and holiday snack boxes. Their one-week delivery goes for $139 and consists of soup, salad, entrees, and up to four dishes and snacks. The style means that you cannot choose individual meals and cannot change the amount you recieve each week. The holiday snacks box, at $49, includes 12 FloBars, coconut maple granola and spiced pecans, each calorie-controlled. Individual components can be added on too, like soups, salads and entrees. NutriFit offers you programs to help you to lose weight, gain weight or maintain your current weight depending on your needs. In fact, they promote many different plans and styles, including meals to help mothers lose weight after childbirth, meals for families, and sports-specific programs. NutriFit offers more customization than most other companies, although the site can be confusing and the service is fairly expensive. However, the marketing is somewhat confusing. NutriFit actually just offers two plans: Essentials and Premium. All other options are simply variations on one of these. The Essentials plan is the cheaper option and provides limited customization. For example, you can specify up to eight allergy exclusions and choose between three calorie levels. Some styles of eating are supported (like diabetes and weight loss diets) but others aren't (like gluten-free and paleo). The Premium plan offers complete personalization. It allows you to change pretty much anything and will support whatever diet style you need. The plan has a daily package and a 28-day package, which both cost $17.95 per day for breakfast only. The more meals you add, the more the prices change. In contrast, breakfast only on the Essentials plan costs $19.95 on the daily plan and $17.95 on the 28-day plan. The plan can cost as much as $43.95 per day for all meals. This 100% vegan food delivery services also does catering and wellness workshops. Their goal is not just to feed you right but to empower you towards living right even when you do things out of the ordinary, like hosting events. They say that it is possible to eat healthy at all times and then go ahead to make it easy for you. Ohhlicious makes their food without preservatives or additives. Ohhlicious is currently undergoing some changes but the company still retains a strong focus on nutrients and quality. They do not have specific meal plans that you can order, but their meals are listed on their website, and you can order whatever food or soup that tickles your fancy. The foods and soups range from $10 to $13 each, and you can order as many as you like. However, the company is going through some changes. They are currently just offering sauces, seasonings and soups, rather than full meals. Despite this limitation, the company is still a powerful one and the soups make easy alternatives to cooking dinner. Paleta is a meal delivery service that provides healthy food and ingredients that are locally grown, non-toxic, and go through minimal processing. They offer multiple different meal plans to choose from, including Plant Based, Paleo, Pregnancy, Market Menu, and Perfect Plate. The Perfect Plate offers the most customization, allowing people to eliminate a wide range of ingredients. Paleta is a good choice for customization. You don't get to choose your meals but there are many options within the menus. Most of these plans offer three different portion sizes. Fit starts at $65 per day and provides 1,200 calories. Lifestyle starts at $76 per day and provides 1,600 calories. Finally, Performance starts at $83 per day and provides 2,200 calories. Those prices include breakfast, lunch, dinner, and dessert. The larger two sizes contain an extra snack as well. The listed prices are for the Perfect Plate version. Other meal plans have different prices. Located in Los Angeles, Vegin' Out is a meal delivery service that strictly offers vegan dishes that are low in fat and sodium. This style makes the meals great for health and they may help to lower diabetes risk and promote weight loss. The company operates off a weekly menu, so you'll always get variety. Vegin' Out has an unusual style for ordering but it is another choice if you want vegan meals delivered to you. The ordering style with Vegin' Out is a little unusual. A single order contains three entrees, four side dishes, a soup and five cookies. You can also get a double order, which simply doubles those totals. You don't get to choose the specific meals you receive, they're just based on the weekly menu. The price starts out at $127.99 per week for the single meal and $234.99 for the double. But, people outside of Los Angeles have to pay significantly more. Kitchen Verde offers meals that 100% plant-based meals, so no animal products are used at all. The company operates out of Rochester, NY and just delivers to Monroe County. People who live locally can also pick up the meals. Kitchen Verde delivers locally and has a limited menu. But, their vegan meals sound amazing and are very inexpensive for what you receive. They serve delicious vegan breakfasts, lunch, dinners, and snacks that are oil-free. They also offer organic cold press juice that is nutritious and can stay fresh in your refrigerator for 3-5 days. The price of their meals ranges from $5-$9 per meal which makes it one of the most affordable meal services. The meals also sound great despite the low prices and nutritional details are provided. There are just two limitations. First, they often run out of stock of their meals. If you're going to order, you should get in early each week. Second, there are no images of the meals, just descriptions. The descriptions are detailed – but images would still be better. The Vegan Garden is a meal service that delivers healthy, delicious vegan food that is gluten-free and environmentally conscious. There are various choices for ordering, including many different meal packages and plans. The packages tend to contain a set number of meals based around a specific theme. For example, one is the Pioneer Meal Deal, which costs $295. It provides breakfast, lunch, dinner, and dessert for seven days. Other packages include Slim Dinners, Get Slim Meal Medley, Skinny Feast Protein Pack, and 5 Day Feast. The meal plans are similar but are designed to be recurring subscriptions. Some allow for more choice. For example, the Customized Meal Plan costs $550 and allows you to choose 28 different meals (an average of around $19.60 per meal). You need to email and specify those meals, as there is no system on the site for doing so. Details on the individual meals are surprisingly hard to find and The Vegan Garden doesn't have a large selection. The Vegan Garden offers multiple plans and packages to choose from. But, these can be a little confusing and the selection is limited. This meal service offers healthy diet for vegans with emphasis on offering tasty meals to reduce the risk of heart disease and diabetes. The cost of shipping is $65, but members only pay $19 for shipping in California and $29 in other states across the US. The most unique thing about Veggie Vibes is that they focus on raw, organic and vegan meals. Their dishes can typically be eaten as-is, or you can heat them up if you prefer. The idea is powerful for health and Veggie Vibes offers some incredibly creative meals. They also use ingredients like raw natural coconut sugar, natural agave nectar, raw coconut oil, dates, and cold pressed olive oil in meal preparation. The menu features a variety of food types, including raw dehydrated items, raw snacks, powers shakes, salads, soups, juices, and smoothies. All foods are free from artificial ingredients, highly processed sugars, and gluten. Veggie Vibes offers raw vegan meals that are creative and appealing. They have multiple plans to choose from and the site is very easy to use. The company provides four different meal plans: Alive, Reset Cleanse, Savory Raw, and Your Selection. Each has a different style and be ordered for three, five or seven days, as a single order or as a subscription. Prices start at $138 per week (Savory Raw Plan, 3 days, on subscription) and go up to $392 per week (Your Selection or Alive, 7 days, single order). The plans provide two or three meals, depending on what you choose. The price per meal varies as well. But, it typically averages out somewhere between $16 and $20 per meal. Located in New York, Sakara is another plant-based meal delivery service. They provide organic meals, with a focus on clean eating and detoxing. To this end, their meal plans come with various detox waters and detox teas. Meals are provided based on a weekly rotating menu. This doesn't give you any control over your food but the menu has some exciting options, including some unusual and interesting meals. They have 3-day and 5-day meal plans. Meals in the 3-day plan come in two deliveries, and in three deliveries for the 5-day meal plan. You can select up to three meals per day as they provide breakfast, lunch, and dinner. Sakara is a powerful plant-based choice with some unique (albeit expensive) meals. There is also a Taste It plan, which is designed as an introduction to the service. It just provides a meal plan for one week, with a delivery charge of $10.00. On the regular plan, three days of meals (breakfast, lunch, and dinner) costs $239, which averages to around $26.50 per meal. Five days of meals costs $420, which is an average of $28 per meal. The prices make this one of the more expensive services out there, although the quality seems to be exceptional. Needless to say, Diet to Go is a weight loss meal delivery program. They offer multiple meal plans, which support weight loss in different ways. The first is Balance, which is calorie-controlled and heart healthy. Balance-Diabetes is similar but is designed for people with diabetes or pre-diabetes. Carb30 is a low-carb diet plan, offering around 30 grams of net carbs per day. Finally, there is a vegetarian plan. It is also designed for heart health and is calorie-controlled. Diet to Go supports weight loss through multiple plans. Their meals are relatively inexpensive too, especially if you order for seven days. When ordering, you can choose the calorie content of your meal (1,200 calories or 1,600 calories), the number of days per week (five or seven), and the meals per day (two or three). The price varies depending on your selection. But, as an indication, the seven-day meal plan with three meals per day costs $173.99 inclusive of shipping. The five-day meal plan goes for $137.99 per week. The price per meal can be as low as $8.57 per meal. Members can personalize the meals that they receive as well. But, this is only possible after checkout and customization options are probably limited. Since 2010, Munchery has been delivering ready-to-eat meals as well as cooking kits to busy individuals. They use a daily rotating menu to ensure significant variation and you can choose the meals that best suit you. Some of their options include side dishes, meal kits, dinners, beverages, desserts, or breakfasts. Their special diet includes gluten-free, nut-free, vegan, egg-free, organic, dairy-free, antibiotic-free, and paleo options. Their cuisines include Mexican, Filipino, Thai, Cajun, Indian, Cuban, and many more. Munchery is one of the few services that provides meal kits and fully prepared meals. They seem to do a great job with both styles, offering many different options. They have numerous membership perks, incredible variety, and support an impressive range of diet types. Their handy app makes ordering super simple, and you can cancel your orders anytime. The cost of the ready-made dinners ranges from below $10 to $18 if you select an haute-cuisine dish. The rates for desserts, sides, and salads start from $4 to $8, while meals for kids range from $4 to $6. Meals are ordered individually, so you don't need to worry about a subscription. The Good Kitchen is a meal delivery service providing meals made from pastured, grass-finished, and grass-fed beef and pork. They serve lean proteins, non-processed carbs, and healthy fats. The meals are free of sugar, soy, and gluten, with a strong emphasis on flavor. Instead of conventional meal plans, customers get to choose the number of meals per week and frequency that they want. This ranges from 5 to 35 meals and selections can be delivered weekly, biweekly, monthly, or as a one-time order. The cost ranges from $70 for 5 meals to $385 for 35 meals. That gives an average of $11 to $14 per meal, which is cheaper than many other services. The Good Kitchen is a powerful choice for flexible meal plans. They also have some interesting options for kids. Members get to choose which meals they want included in the plan. The meals look appealing but the selection is limited and dishes often sell out. Various snacks and other products can be added on. There is also a separate kids meal subscription that offers lunchable-style boxes. These are less expensive and give you the same control over how many you get each week. IONUTRITION is related to the company Fresh n' Lean and specifically provides high-performance and nutrient dense meals. The dishes tend to be more satisfying than most other services. The company also avoids added sugars, preservatives, GMOs, additives, gluten, hormones, or dairy, which leads to extremely healthy meals. Their meal plans include ION Protein +, ION Paleo (Low-Carb), and ION Original. All deliveries are free of charge, and their services are convenient. They deliver the meals in ultra-portable refrigerated bags to ensure the food remains fresh. The Original Plan starts at $11.99 per meal, the Paleo Plan is $12.69 per meal, and the Protein + Plan is $12.25 per meal. Each plan allows you to choose which meals you get each day (breakfast, lunch, and/or dinner) and how many days per week (five or seven). The total price varies depending on your selection. Mom’s Meals is a go-to fresh meal delivery service located in Lowa whose primary focus is on seniors and the sick. This meal service’s special menu includes heart-friendly, cancer support, gluten-free, renal-friendly, low sodium, vegetarian, diabetic-friendly, and pureed meal options. Every meal contains around 700 calories and includes vegetables, grains, snacks, and proteins. The company is unusual in that it supports individuals, agencies, and healthcare providers. In some cases, insurance may even pay for the service. The meals provided aren't as amazing quality as many of the other options. But, the large range of diet types makes up for this. Mom's Meals is easily one of the cheapest meal services and supports more diet types than most other companies. 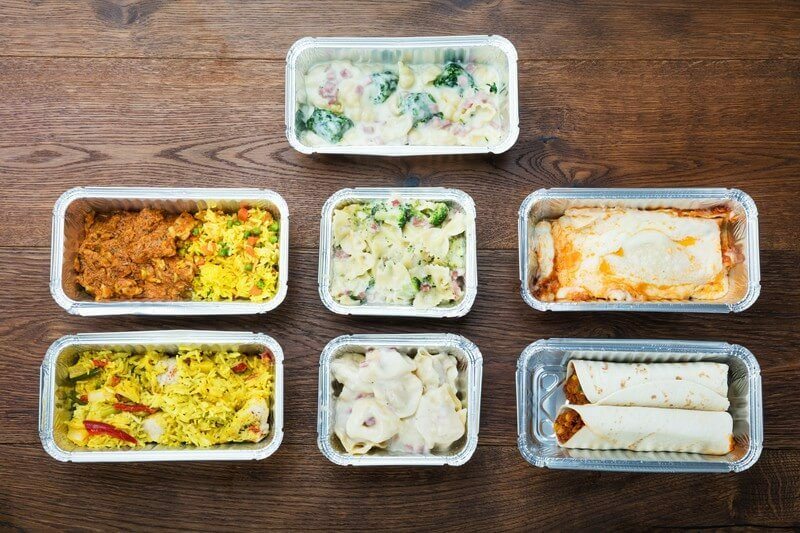 Meals from this company can stay fresh for up to 14 days in the refrigerator, due to special packaging. There are more than 60 individual meals to choose from. Meals are simply ordered in bundles of 7, 10, 14 or 21 meals. Pureed meals cost $7.99 each, while all other dishes are $6.99 each. The flat shipping charges are $14.95 per order. Martha’s Senior Gourmet is a second meal service that works perfectly for seniors. They offer a variety of meal types as well, including diabetic diet, sodium diet, low potassium, renal diet, and other special diets. All meals are nutritionally balanced and can be tailored to meet specific dietary requirements. These include options like low-calorie, vegetarian, dairy-free, and pureed. Martha's Senior Gourmet caters for many dietary needs and is specifically designed with seniors in mind. Individual meals typically contain 2 oz of roasted, grilled or steamed vegetables, 4-6 oz of proteins, and 3-5 oz of starch. These meals are never frozen, and there are 28 different lunches and dinners with a four-week rotation. Prices vary significantly depending on the plan and the number of people. But, as an indication, the Specialty Dinner Plan costs $309 for one person and $610 for two people (three dinners a week for four weeks). The Healthy Life Dinner Plan goes for $284 per person for the same frequency and duration. The Weekly Meal Plan costs $120 for five dinners or $195 for five lunches and five dinners. Whether you need mindfully designed menus to satisfy your macronutrient needs or in need of whole organic meals, Thistle is unsurpassed. The company has a strong focus on superfoods, resulting in many amazing dishes. Some examples include a Strawberries & Cream Smoothie for breakfast, Pinto & Black Bean Taco Salad for lunch, Red Pumpkin Coconut Curry for dinner, and snacks like Pumpkin Spice Snacking Cake. Thistle is a superfood-based company that offers some amazing meals to people in California. You can cancel, skip or pause your subscription at any time prior to 11:59 pm on the Thursday before the upcoming week. If you are unsatisfied with their meals, they will credit you. All meals are free from gluten and dairy, and there are no shipping charges. Meal prices in San Francisco, Orange County, Los Angeles, and San Diego start at $11.50 for a vegan meal, and meals that include meat cost $13.50 per serving. Subscriptions can cover three, four, five, or six days each week. People elsewhere in California can just choose between six or nine meals per week, which starts at $66/week for vegan meals. The company doesn't deliver outside of California. Bistro MD focuses on creating meals for weight loss that still taste good and aren't boring. They provide four different programs to choose from: Standard, Gluten-Free, Diabetic, and Menopause. In each case, you can choose either two or three meals per day, for five or seven days a week. The plans mostly work as you might expect. However, the full program for seven days provides seven breakfasts, seven lunches, and six dinners. The one missing dinner is intentional – to give people the chance to practice what they learn. BistroMD offers various weight loss plans and the ability to order for either five or seven days each week. This food service has an individualized support to help you all through your diet journey. You get a 25% discount plus free shipping on your first order. The rates for the 7-Days full program are $179.95 with all meals. The 5-Days plan costs $149.95 for the whole program. The lunch and dinner plan goes for $149.95 for a week in the 7-Days plan and $119.95 per week for the 5-Days program. Those prices are without the discount. eMeals is a meal planning service. It's designed to make it much easier to shop and eat, reducing the time you need to spend hunting down recipes. eMeals allows you to sign up for weekly meal plans that provide recipes you can pick and choose from. You are then given a shopping list. You can buy the ingredients yourself, or send the list to services like Walmart Grocery, Instacart, or Kroger Clicklist. The provided plans include: Clean Eating, Quick & Healthy, Low-Calorie, Paleo, Vegan Meals, Low Carb, and Budget Friendly. There are also Diabetic, Gluten-free, Classic, Heart Healthy, Vegetarian, Mediterranean plans, along with many other options. eMeals is a meal planning service and it caters for a very wide variety of dietary needs. The style is less convenient than a company that delivers fully prepared meals. After all, you still need to cook. But, the idea can support many more diet types than any meal company could hope to. In fact, they offer more than 20 options with great customization features for each meal plan. The subscription is relatively inexpensive. Subscribing for three months just costs $10 per month, while a yearly subscription calculates out to around $5 per month. There is also a 14-day free trial. You can switch your meal plan whenever you like and the company offers an easy-to-access app for iOS and Android devices. LeanBox is a meal delivery service with over 15 years of expertise in healthy foods. Their menu features Lean Box, Lean Lunch Box, Snacks, Family Style Meals, Individual Size Meals, and Paleo Meals. They provide many types of food, including sandwiches, fresh entrees, salads, beverages, along with options. LeanBox is primarily designed for the corporate environment and has some unusual features. LeanBox meal delivery service offers a variety of services including an office water service, fresh office food, office on tap, office hot coffee, and office fruit, snack & dairy. The meals are always fresh with no preservatives. With the Lean Box menu, the price for four meals is $16, while for six meals is $21. The Lean Lunch Box which incorporates a broad range of meals has a standard price of $7.75. The cost of the Family Style Meals starts from $27.96 up to $55.92 per meal. Most meals in the Paleo Meals have a price of $8.50 while the cost of the snacks starts from $3. If you are looking for chef-prepared meals or a gourmet menu, Home Bistro meal delivery service is a perfect choice. They aim to provide simple options, without the need for subscriptions. Instead, members can just choose meals from the site and these are delivered to your door. They have recently introduced some new styles of meals, including superbowls that aim to be powerful sources of nutrition. Home Bistro normally offers individual flash frozen meals that you can purchase, including a range of superbowls. The site is presently going through a transition period and offers few individual meals. Most have already been sold out and the company shows no signs of offering new ones. However, it is still possible to order some bulk dishes. For example, the company sells a 3.25 lb Pork Loin Roast for $39.99 and a pack of 12 Boneless Chicken Breasts for $42.99. Ever heard of a meal delivery service just for babies and toddlers? Well, that is Nurture Life for you. Their facility is devoid of tree nuts, shellfish and peanuts and they cater to most other allergies. The prepared meal service has three plans; the Babies is suitable for children between six and 12 months old. The Toddlers program is for your little ones in the range of one and three years. For your children aged four to 18, there is the Kid plan. Nurture Life is specifically designed for the needs of children, offering nutritionally balanced meals for each age group. All you have to do once you get the food is heat it up. For babies, you can order either 8 or 14 meals per week. For toddlers and kids, you can choose between 5 and 10 meals each week. The babies plan has three categories: Stage One, Stage Two and Stage Three, based on the age of the child. Prices for meals start at $35 per week. Top Chef Meals delivers ready to eat meals right to your doorstep. It is a relatively simple service and the meals provided aren't organic. Likewise, most of the dishes are fairly traditional and you'll find options like Turkey Meatloaf with Mushroom Gravy and Meat Lasagna. Even so, they do cater for low-sodium, diabetic, gluten-free, dairy-free and low fat diets. They also have a kids plan, a family plan, and a paleo plan. Most meals include a protein source and allow you to choose the sides. For example, the Turkey Meatloaf defaults to having Sweet Potatoes and Green Beans as sides but you can change both of these using drop down menus. Nutritional information is provided for each component and for the meal as a whole. Top Chef Meals is a simple service but they offer inexpensive meals and the ability to select meal components. They have breakfast, lunch, dinner and even dessert menus. They have an Easy Order package with nine meals, which costs at least $63.15. When you order A la Carte meals, you will pay between $2.75 and $10.75 per serving, depending on the meal chosen. Seniors above 60 get a 15% discount. The Shipping fee for orders below $110 is $9.95, and there is no cost for orders above that value. Despite changing the name from Pre-Made Paleo to Truefare, all of the meals on offer are paleo. In fact, they all fall under the Whole30 diet protocol as well (with one or two clearly labeled exceptions). Many of their meals are AIP and/or keto-friendly as well. Truefare offers many options for ordering, which get a little complicated. The problem is that they don't have traditional meal plans. Instead, they have various collections and packages. Each has different features and the details aren't always clear. For example, there are 5-day, 10-day, 20-day and 30-day Whole30 plans, along with a smaller selection of AIP and keto plans. Most of the plans have a set number of meals and you have no choice about what is included. Few details are provided and there is no ability to see the meals, let alone customize them. TrueFare offers many different plans and menus, including Whole30 and AIP options. Prices vary between the different collections. Examples include $179.95 for a 5-day Whole30 order, $175.00 for a 5-day AIP order and $198.98 for a 5-day Keto and Whole30 plan. Meals can be ordered A la Carte as well, often ranging from between $13.95 and $15.95 each. If you are keen on getting fit, staying fit or building muscle, this is the meal delivery service for you. Their programs include the Lean meal designed to help you lose weight, the Maintain plan for performance and weight maintenance, and the Gain plan if you would like to build more muscle. Regardless of the style, you can choose from Standard and Light Meal plans. These provide 6 oz meals or 3 oz meals, respectively. You can choose to order either 12, 18, or 24 meals at a time. Muscle Meals offers 6 oz and 3 oz meals – and can work well for weight loss, performance, or muscle development. Muscle Meals To Go orders arrive frozen, and it is advisable to thaw them before heating. However, you can auto-order and have your meals delivered as often as you would like. Prices for the Standard plan options start at $9.75 per meal. For Lite meals you pay at least $7.50 for each dish. MealPro is a prepared meal service focused on making you the best workout meals. The dishes often contain 35 grams of protein (or more), making them very satisfying. All meals also contain 10 oz of grains and veggies, along with a seasoning sauce. Meal Pro is an interesting service but their selection is very limited. The company promotes various plans, including Gym Food, Workout Diet and Workout Meals. However, ordering options are the same for all plans. You simply choose a box of either 10 or 15 meals. Shipping is $10 for the smaller box and free for the larger one. You then select which meals you want in your box. The dishes look appealing but selection is limited. There are just eleven dinners to choose from and two breakfasts. The meals are priced individually, with the dinners ranging from $8.49 to $12.49.